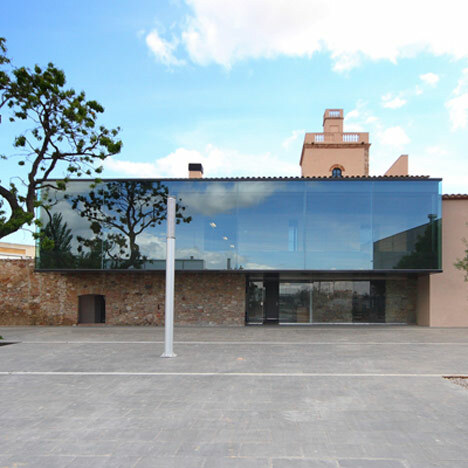 TWO/BO Arquitectura and architect Luis Twose have converted a sixteenth-century Catalan house into a business academy for a pharmaceutical company. A glass-fronted extension cantilevers out from the west face to shelter the main entrance of the Grifols Academy. A new spiral staircase joins up with its sixteenth-century counterpart inside the restored stone tower, leading to a rooftop terrace. The academy provides training facilities, conference rooms and a terraced ground-floor bar. The aim of the Project was to convert a sixteenth-century house into a new academy centre. The site is located in Parets del Vallès and is surrounded by a group of new factories. The house was one of the few vestiges of the rural past of the town. Before our intervention, the house was abandoned and it was in danger of collapsing. It had suffered a lot of renovations and extensions which had obscured the original shape of the building and were now in a state of disrepair. This project led to requalification of the existing building, on one hand enhancing and recovering the most historic values, and on the other, clarifying its spaces, which were dark and chaotic, by a new layout with two visual axes and through the introduction of natural light which now reaches every space of the house. We focused our intervention on two points, the west façade and the interior of the tower. On the west façade, we designed a new access path ending in a plaza which leads to the entrance of the academy. This entrance is framed by a new “loggia” (an open-air gallery) which was designed to be a neutral but modern element of iron and glass whose shape connects old parts of the west façade. The defensive tower, which had been the old symbol of the house, has been restored. The floors were removed to create a dramatic vertical space that leads to the old wooden staircase at the top of the tower. With all the plaster removed, the underlying stone structure is now visible. The project also involved the landscaping of the grounds. Taking into account the industrial surroundings, and we have tried to create a quiet oasis by making the most of the existing topography, and by planting local vegetation.